According to the model of Porter’s five forces it is worthwhile entering web design industry. Most of the forces are weak and even the strong ones are not impossible hurdles. In figure 3 you see an overview of Porter’s five forces in the web design industry and the changes that occur if the complexity of the web site increases. There is a great competition between the web designers, but there is also a growth which is enough to enter the industry. But within the last five years the rivalry situation has been stronger and the market growth lower. With technological advancements the entry barriers and the knowledge have grown. For a professional web site today you need more than informatics knowledge, but also a good marketing knowledge and the ability to negotiate with your customers. With the right strategy it is still possible to make a lot of money online. Between the 15 and the 30 of November 114 web design agencies with more than 5 employees were asked about their industry. The questionnaire was sent by email or the social networking portal Xing. 68 of them sent the questionnaire back. See the results of the Webdesign and SEO Questionnaire! Denic (2009) Statistiken – www.denic.de [online] Available from: http://www.denic.de/de/hintergrund/statistiken.html [Accessed 16 December 2009]. Digital Media Trends (2009) DigitalMediaTrends: Wie groß ist Googles Marktanteil am Werbemarkt [online] Available from: http://www.digital-media-trends.de/2009/07/wie-gro%C3%9F-ist-googles-marktanteil-am-werbemarkt.html [Accessed 16 December 2009]. Facebook Inc. (2009) Facebook: Startseite [online] Available from: http://www.facebook.com/ [Accessed 16 December 2009]. Kollmann, T. (2007) E-Business: Grundlagen elektronischer Geschäftsprozesse in der Net Economy. Edition. Wiesbaden: Gabler. Lipsay, R. and Crystal, K. (2007) Economics 11 Edition. Oxford: Oxford university press. Lynch, R. (2009) Strategic Management, 5 Edition. Harlow: Pearson Education. McKay, J., Marshall, P. (2004) Strategic management of E-Business. Milton: National Library of Australia. Porter, M. E. (1980) Competitive Strategy: Techniques for Analyzing Industries and Competitors. 1 Edition. New York: The Free Press. Porter, M. E. (1985) Competitive Advantage: Creating and Sustaining Superior Performance. 1 Edition. New York: The Free Press. Schäfer-Mehdi, S. (2006) Das professionelle 1×1 Event-Marketing. Edition. Berlin: Cornelson. Statista (2009) E-Commerce-Umsatz: Prgnose 2008 – 2011 [online] Available from: http://de.statista.com/statistik/daten/studie/70732/umfrage/prognose%3a-e-commerce-umsatz-2008-bis-2011/ [Accessed 16 December 2009]. Tagesschau (2009) EU-Staaten wollen mit Staatshilfen Opel-Werke retten [online] Available from: http://www.tagesschau.de/wirtschaft/opel1132.html [Accessed 16 December 2009]. Team23 GbR (2009) Webanalyse – Aktuelle Browser Marktanteile [online] Available from: http://www.webmasterpro.de/portal/webanalyse-aktuell.html [Accessed 16 December 2009]. Tedeschi, B. 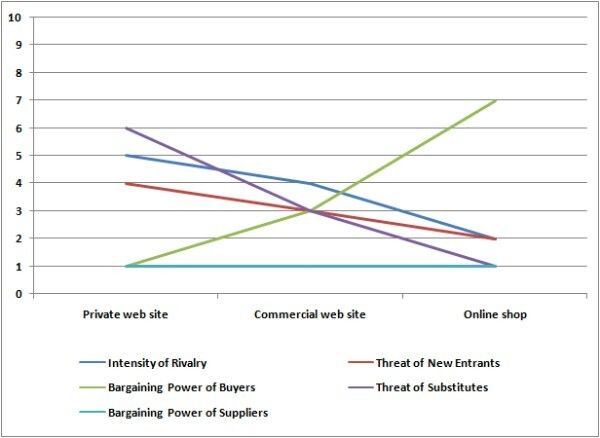 (2009) Late to Web retailing? There’s still money there – New York Times [online] Available from: http://www.nytimes.com/2007/08/27/technology/27ecom.html [Accessed 16 December 2009]. Verisign (2009) The domain name industry brief: volume6 – issue3 – september2009 [online] Available from: http://www.verisign.com/domain-name-services/domain-information-center/domain-name-resources/domain-name-report-sept09.pdf [Accessed 16 December 2009]. W3C (2009) W3C Mission [online] Available from: http://www.w3.org/Consortium/mission [Accessed 16 December 2009].